In the marketing world, the concept of the “energy drink consumer” conjures up a certain stereotype: single teenage and early 20s males desperate to keep their eyes open during and after long nights of playing video games in their basements. This is the gut-level concept around which many marketers are targeting not only energy drinks, but also myriad other products designed to appeal to this young, carefree crowd. But according to new research, this profile is dramatically askew from reality. In fact, today’s average energy drink consumer might represent a seriously undertapped opportunity for advertisers across many verticals. The surprisingly grounded nature of this audience makes it a relevant target for family-oriented brands, and energy drink companies could represent powerful cross-promotional allies for companies looking to connect with this sizeable cohort. 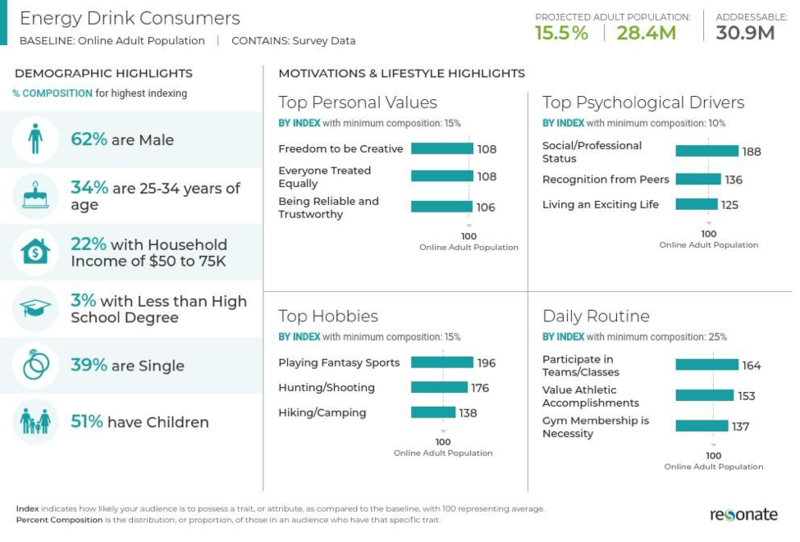 To better understand the values and motivations that drive today’s energy drink consumers, Resonate tapped into its consumer intelligence marketing platform to uncover the driving forces and daily habits of this group of consumers. We found that about 28 million U.S. adult online consumers (15.5 percent) consumed energy drinks in the past 30 days. In addition, what we uncovered was not the unattached youth that we expected. In fact, more than 50 percent of energy drink consumers are age 25-44, and more than half of them have children. In fact, energy drink consumers are 46 percent more likely than the rest of the population to have kids under 5—which, as you might imagine, explains the need for regular energy boosts. At a high level, energy drink consumers share similar personal values with the average American. They value creativity, equality and reliability. But they are notably different when it comes to their psychological drivers, hobbies and routines. These individuals are heavily driven by a desire for social and professional status, recognition by their peers and—yes—the desire to lead an exciting life. They like playing fantasy sports and participating in outdoor activities, and you’re likely to find them playing team sports and at the gym. While the hobbies and routines of energy drink consumers might not be terribly surprising, this audience comes into a new light when you blend in the high prevalence of parenthood and the high valuation of reliability and trustworthiness among this group. In fact, you find a perfect target audience for any brand looking to connect with young, active parents. According to our deeper analysis of this group, marketers might not want to rely on traditional advertising channels to reach these folks. Although age-based offline buys might seem like a good idea at a high level, you would have to buy a lot of spots in a lot of different places to reach this audience at scale. Rather, online buys make more sense for reaching this group with relevancy and frequency. But it wouldn’t hurt to sprinkle in some TV on the four major networks (ABC, NBC, CBS and Fox), along with coverage during NFL football games. Chip Crane is executive director of client solutions for Resonate. 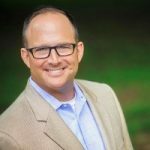 His areas of expertise include B2B business development, SaaS sales and implementation, relationship building, advanced analytics and moving big ideas through organizations, affecting profitable change.